He was born in Brooklyn, N.Y. on December 20, 1939, to Martin and Agnes Mary (Ronayne) Hamrogue. He had two sisters, Winifred (Donahue) Hamrogue and Agnes (Coakley) Hamrogue, and one brother, Richard Martin Hamrogue, who died in 1962. Father Hamrogue served the mission of the church as a Redemptorist in many locations. He was professed on August 2, 1958, and ordained a priest on June 23, 1963. Before beginning his ministry, he studied at The Catholic University of America, earning a post-graduate degree in 1965. His first ministerial assignment, beginning in August 1965, was as a teacher at the Redemptorists’ St. Alphonsus College in Suffield, Conn. In 1968 he was assigned to further study at Fordham University, earning his Ph.D. in history in 1974. His dissertation was titled “John A. Andrew, Abolitionist Governor, 1861-1865. In early 1971 he returned to St. Alphonsus College, assigned as prefect of students of the formation program. In July 1978 he was made associate pastor of St. Mary’s Church in Annapolis. In 1980 he was assigned to the parish mission band of the Province. 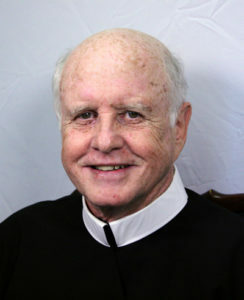 He relocated as a preaching missionary to St. Peter the Apostle Church in Philadelphia in 1981 and remained there for six years before beginning an assignment at Mount St. Alphonsus in Esopus N.Y., which was starting off its years as a retreat house. In 1990 he was assigned to the Redemptorist missions in the English-speaking Caribbean, serving in Dominica and St. Lucia. In 1998 he returned to the United States and spent six years as associate pastor of his home parish, the Basilica of Our Lady of Perpetual Help in Brooklyn. In 2004 he returned to St. Peter’s in Philadelphia for one year, and in 2005 was assigned to St. Mary’s in Annapolis to work with the parish’s Hispanic community. He was assigned again to Brooklyn in 2008. In 2010 he returned to St. Peter’s as an associate pastor till August of 2015. From there he went to Immaculate Conception Parish in Bronx N.Y., to serve as associate pastor. For seven years he worked with Father Donald Miniscalco, C.Ss.R., who remembers spending time with Father Hamrogue, studying historical records and moral scholars and creating their vision for the Redemptorist mission. Their first mission together was in Germantown, Tenn.
Father Miniscalco said his partner’s talks were well researched and had his listeners waiting for the next word. Father Hamrogue’s talks were well received by teenagers too, said Father Miniscalco. He also remembers Father Hamrogue as a person of prayer—in his daily life and in preparation for his talks. I met Father Hamrogue when he became the prefect of students at St. Alphonsus College. He was calmness in chaos and a witness to prayer, listening, and caring. Father Hamrogue was a person who cared about others. He loved the Redemptorists and his priesthood and shared that love with the people the Lord brought into his life. His wake and funeral will be held in the lower church of the Basilica of Our Lady of Perpetual Help, 526 59th St. Brooklyn, NY 11220.